Award winning Granola. Original Flavour. 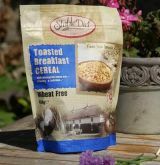 Wheat free toasted breakfast cereal, packed with toasted whole oats, nuts and seeds, our Irish granola makes a healthy and wholesome breakfast or nutritious snack at any time during a busy day. For that perfect breakfast, try it with fresh fruit and yoghurt.